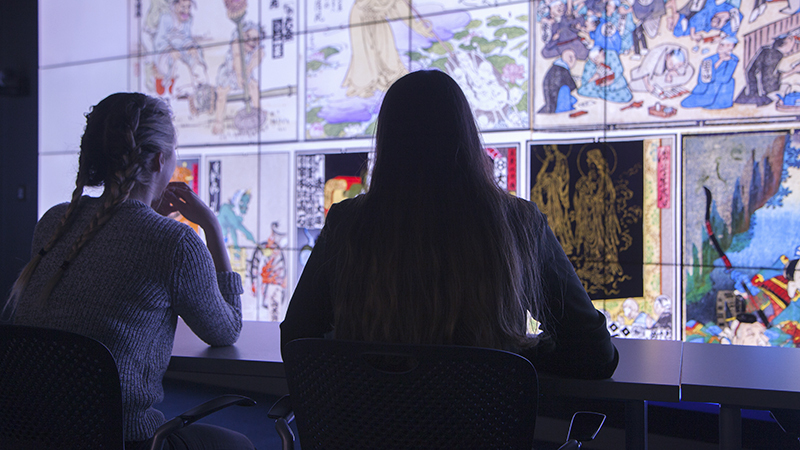 24 HD displays tiled and connected to create a 50-million-pixel screen – a resource for viewing high-resolution images and data visualizations for research and instruction. 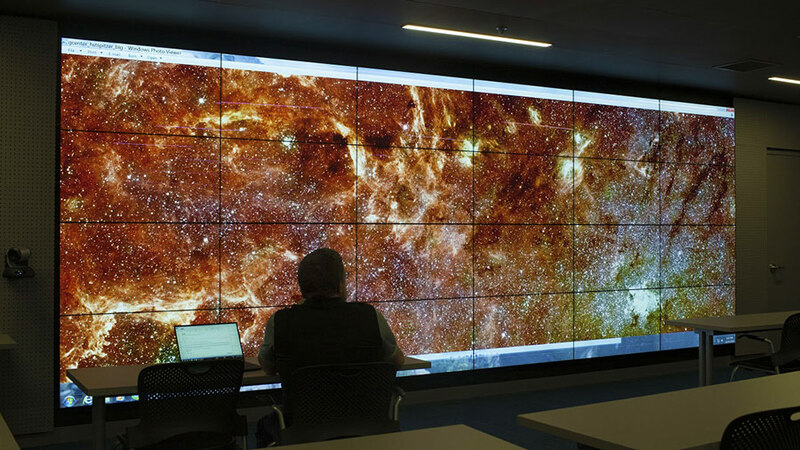 The PSC visualization lab is available for UO faculty and GTFs, and others with data visualization needs or who need to use a large, high-resolution video wall. To reserve the space or locate lab-specific resources, start here. 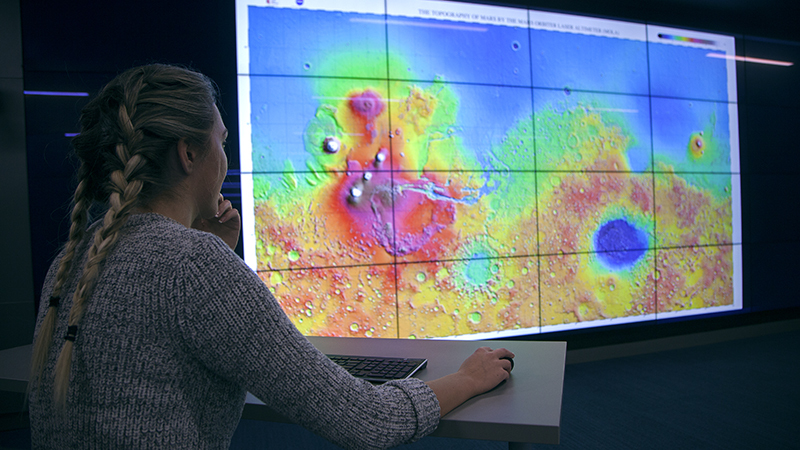 The space is available first to UO community members who want to use the room's high-resolution display and visualization capacity for instruction or research; for example, a class might visit the space to view large-scale high-detail images, or a research team might need to display code and output adjacent to each other at a high resolution. Check the calendar before you put in your request; other uses will be considered on a case-by-case basis. 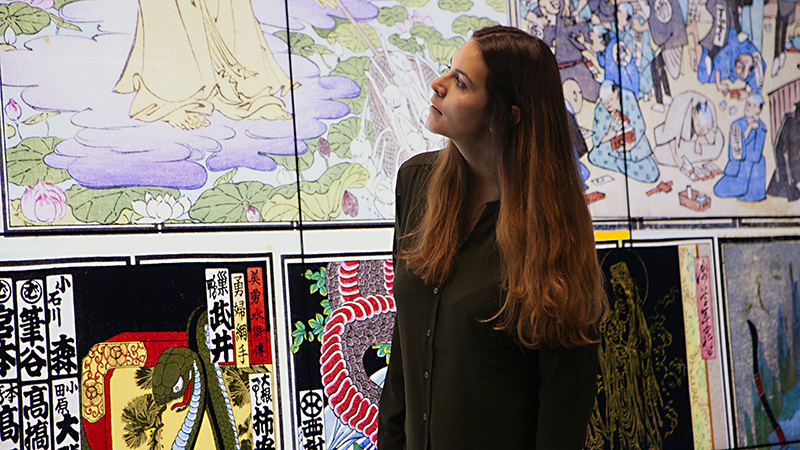 Because the use cases and possible software needs for this space, which was designed to be used for both research and instructional purposes, could be complex, reservations for the room are moderated and require some lead time. There is currently a resident Windows 10 computer in the room, as well as a variety of other resident and input options. Examples of use might be to create or view a visual representation of large data sets; to view materials which when blown up for visibility are too large for a conventional monitor; to videoconference with other sites; or to display multiple large images side by side. Once you put in your first request, you can expect we will contact you about how you hope to use the room so that we can make sure we have any software you need in place, and so that we can arrange a time for a brief orientation to the space. Our hope is that this is not intrusive, but rather, that it leads to successful use of an unusual space. Our expectation to start is that most users will be UO faculty or grad students; however, undergrads who have a need for the room's equipment are welcome as well. If you have questions about whether you are eligible to use the room, or whether a particular use is appropriate, please contact the manager, or stop by during weekday hours.